About "GNB Good News Bible Youth Edition (Anglicised)"
links to a dedicated YouTube playlist with 30 videos unpacking and offering support onkey themes and issues found in the Bible. space for writing, doodling and drawing. a full-page introduction to each book of the Bible, showing what it's all about and how it fits into a bigger story. 32 colour pages of key things to know about the Bible, help with tough topics, and journalling space. Young people helped us put this Bible together. We listened to their ideas and heard what really matters to them: information to help them learn and dig deeper into the Bible's message, challenges to make them think about what they read and tools to help them act on it - as well as time to reflect and space to create through journalling, drawing and adding colour. "A fantastic way of getting the most important book in the world into the hands of a new generation. I wholeheartedly commend the Bible Society and Youth for Christ for working together on this vital initiative. Get a copy today for any young person you know." Director of Mission, Evangelical Alliance. 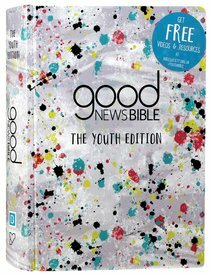 Good News Bible - The Youth Edition helps young people to explore their own responses to the Bible's timeless message in a way that's relevant to their lives. Regardless of where a young person is on their faith journey - this Bible is for them.